A dental implant is a perfect substitute for a missing tooth. Introduced in the US over 30 years ago, techniques have much improved, now making it a firm favorite due to its natural feel and durability. A dental implant really does feel just like one of your natural teeth – only it lasts longer! 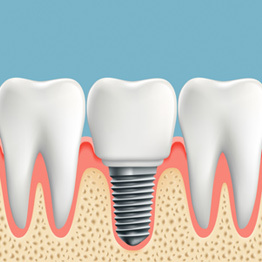 Dental implants are titanium rods or screws embedded into your jawbone. They are also biocompatible, meaning there’s no risk of allergy. After the insertion of an implant, an extension (also called an abutment) is then secured to it, so a new dental crown can be placed on it. The result? A brand-new tooth and a brand-new smile! We are proud to be able to claim we are specialists in dental implants. Our accredited implantologists really are the masters of their art as thousands of clients will no doubt attest. A dental bridge is as good as it gets if you don’t feel like having a dental implant. 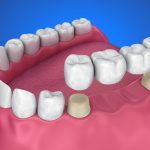 It serves to connect two existing (natural or implanted) teeth by creating a bridge between them and replacing one, two or even three missing teeth. It is made of porcelain and we even go as far as to find the color that perfectly matches the real color of your existing teeth! The process is relatively simple: on each of the existing teeth, there’s a crown to hold the bridge and there’s one more on top of it. The preparation is the same as with dental crowns, meaning the procedure takes exactly the same short amount of time. Having said that, due to durability and a more natural feel, we generally recommend using dental implants rather than a bridge. A veneer is a thin layer of porcelain put on the front surface of your tooth. When compared to natural teeth, it does look white and healthy and is thus the perfect enhancement of your smile. Due to this, and also because inserting a veneer is a quick and easy procedure, they are used for aesthetic purposes. Just like veneers, dental crowns too will visibly enhance your smile in one quick and simple step. A tooth crown or a tooth cap is a porcelain cap made from pure ceramic and is placed on top of a tooth, being carefully placed over a natural tooth or dental implant. Using our brand new modern lab, we will either create your crown using a 3D or a dental milling machine or have it tailor-made by hand. It will look and feel just like natural teeth and be even stronger! This is a bestseller for a reason. Drop in for a single day and leave with a smile! Endodontics means the cleaning and healing of root canals. Especially if the dental pulp is injured or dead or if the canal is inflamed, this simple procedure can help you save your tooth and a fair bit of money. In a further step, we take care of the outside of your teeth by filling in your cavities with white sealants and move on to the front. It’s time for whitening. Whitening is getting ever more popular and one of the reasons is it’s very accessible. It doesn’t really take more than an hour to put a layer of whitening gel on your teeth and then letting a few rays of the acceleration lamp shine on it. This has to be repeated three times, even so, we’re done before 60 minutes have passed. Having done all this, it would be a shame not to deal with the last part. Dental hygiene serves to remove tartar, plaque, and pigment that may have appeared as a result of drinking coffee and smoking. It is a preventive procedure but it also contributes to you feeling more comfortable, but that’s not all. Generally, we suggest having dental hygiene done twice a year as it can also save you a lot of money in the future. That’s it. A single day, four procedures and you won’t believe the difference!